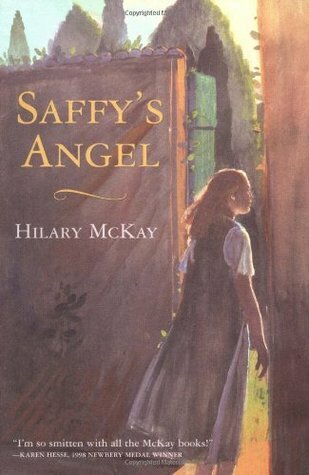 Saffy's Angel by Hilary McKay is the first in a series of five books (soon to be six) about the Casson family. It was originally published in the UK in 2001, and became available in the US in 2003. There are six Cassons. Eve and Bill, the parents, are artists. Bill is much more serious about his work than Eve is about hers, and he maintains a studio away from the family in London. Eve stays home in the Banana House, as the family home is called, with the four children - 17-year-old Cadmium (Caddy), 14-year-old Saffron (Saffy), 12-year-old Indigo, and 8-year-old Rose. Each of the kids has a storyline in this first book - Caddy flirts with her driving instructor, Indigo tries to cure himself of his phobias, and Rose runs interference between her parents - but the star of the show is definitely Saffy. Early in the book, Saffy realizes that all of the kids in the family have names found on a color chart in the Casson kitchen, except for her. When she presses her mother for an explanation, she learns that she was not named by Eve and Bill, because she is not biologically their child. Rather, Saffy's mother is Eve's deceased sister, and she was adopted into the family after her mother's death. This information really isolates Saffy, and when her grandfather dies and leaves her a mysterious angel in his will, she becomes even more curious about her past. With the help of a new friend, Sarah, who uses a wheelchair and is therefore somewhat spoiled by her parents, Saffy hatches a plan to travel back to her birthplace, Siena, Italy, to try and locate the angel. While some plot points in this story were weak and implausible, overall, I really enjoyed it. I especially like the fact that none of the characters in this book are perfect. The parents are absent, either physically or mentally. Caddy is fairly clueless, and a terrible driver. The house is a mess, and Indigo routinely throws himself out of windows to try and stop being afraid of heights. Saffy manages to stow away to Italy without being caught, and the rest of the kids all drive to Wales together, after tricking their mother into giving her permission. Rose also lies to their father and manipulates everyone to suit her own purposes. The Cassons are not the Penderwicks, or the Melendys, or the Moffats. They're not even the Boxcar Children, who spent a lot of time on their own. They're more like the Tillermans from Cynthia Voigt's books, who struggle with family problems, or, for lack of a better comparison, Jane's artsy parents on the MTV animated TV series, Daria.